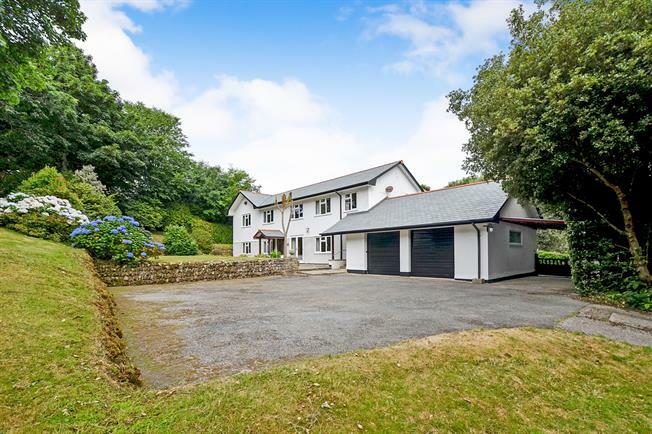 6 Bedroom Detached House For Sale in St. Agnes for Offers in the region of £925,000. A truly unique opportunity to purchase a six bedroom family home with the added benefit of a one bedroom annexe with its own entrance and garden. The property was re-roofed in natural slate in 2016 and has beautiful mature gardens, nestling in over half an acre. With Approximate floor area of 4300 square feet. The house lies in the heart of the village but has the serene quietness that you would not expect for it's location. This really is a gem and I would not hesitate in viewing this property at your earliest convenience. Oil fired condensing boiler and hot water cylinder. Wall mounted cupboards, and worktops. Belfast sink with mixer tap. Space for washing machine and tumble dryer, Vinyl flooring. UPVC French double glazed doors, opening onto the patio. Double glazed uPVC window facing the front overlooking the garden. Double opening doors to kitchen. Radiator, carpeted flooring. Two double glazed uPVC windows facing the rear overlooking the garden. Radiator, vinyl flooring. Roll top work surface, wall and base units, stainless steel sink with drainer, integrated electric double oven, electric hob, over hob extractor and integrated dishwasher. With a wide range of shelving. UPVC double glazed door, opening onto the patio. Double glazed uPVC window facing the front overlooking the garden. Fan assissted radiator, carpeted flooring. Radiator, vinyl flooring, double built-in cloaks cupboard, part tiled walls. Close coupled WC, vanity unit with counter top basin and waterfall mixer tap, extractor fan. UPVC double glazed door, opening onto the garden. Double aspect double glazed uPVC windows facing the front and side overlooking the garden. Radiators and log burner, carpeted flooring, beamed ceiling. Double glazed uPVC window facing the rear overlooking the garden. Radiator, carpeted flooring. With a wide range of Shelving. Double Garage . Two up and over garage doors. UPVC window facing the side, power and light. Stairs from hallway leading to first floor landing. Double glazed uPVC window to the front overlooking the garden. Airing cupboard with double doors and radiator. Double bedroom; double aspect double glazed uPVC windows facing the front and side overlooking the garden. Radiators, carpeted flooring, a built-in triple wardrobe. Double glazed uPVC window facing the side overlooking the garden. Radiator, vinyl flooring, part tiled walls. Close coupled WC, walk-in shower, double vanity units, extractor fan. Double bedroom; double aspect double glazed uPVC windows facing the rear and side overlooking the garden. Radiator, carpeted flooring. Double glazed uPVC window with obscure glass facing the rear. Radiator, vinyl flooring, built-in vanity unit with twin sinks, part tiled walls. Close coupled WC, panelled bath with mixer tap, extractor fan and bidet. Radiator, vinyl flooring, part tiled walls. Close coupled WC, panelled bath with mixer tap, shower over bath, pedestal sink and wash hand basin with mixer tap, extractor fan. Double bedroom; double glazed uPVC window facing the side overlooking the garden. Vanity unit with wash hand basin and built in double wardrobes either side, radiator, carpeted flooring. Double bedroom; double aspect double glazed uPVC windows facing the front and side overlooking the garden. Vanity unit with mixer tap,, radiator, carpeted flooring. Double bedroom; double glazed uPVC window facing the front overlooking the garden. Vanity unit, radiator, carpeted flooring. Radiator, vinyl flooring, part tiled walls. Close coupled WC, panelled bath with mixer tap and shower attachment, pedestal sink and wash hand basin with mixer tap, extractor fan. UPVC double glazed door, opening onto the garden. Double aspect double glazed uPVC windows facing the front and rear overlooking the garden. Electric heater and log burner, carpeted flooring. Double glazed uPVC window with obscure glass facing the side. Electric heater, vinyl flooring, tiled walls. Low level WC, walk-in shower, pedestal sink and wash hand basin. Double glazed uPVC window facing the rear overlooking the garden. Electric heater, carpeted flooring. Double glazed uPVC window facing the front overlooking the garden. Vinyl flooring, tiled splashbacks. Roll top work surface, wall and base units, stainless steel sink with drainer and mixer tap, space for, electric oven and fridge. A winding driveway leads up to the parking area which has spaces for numerous vehicles. The property has a Cornish slate patio to the front with a pitched roof porch and outside tap. The garden is beautifully maintained, and features areas of lawn, adorned with copious mature shrubs and bushes. Various types of trees line the driveway and borders of the garden. A covered parking area with wooden gates lead to the rear garden, which is laid mainly to lawn. There is a block built store at the rear of the garage. Wide steps lead down to a gate which opens onto Rosemundy giving easy pedestrian access to the main street in the village.